Don Quijote is a superstore here in Hawaii. We call it "Asian Walmart." Our day began with breakfast at the Hilton, followed by a stop at the UPS store to pick up some of our shipped boxes, then a trip to Don Quijote. 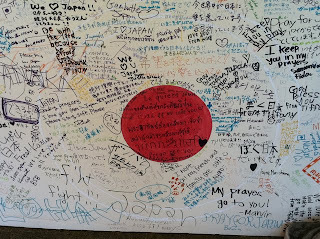 At the entrance to the store, locals had made a banner and signed it for the people of Japan. People mostly wrote prayers and hopes. One boy wrote that he hopes his Japan Mom is okay. It was a reminder of how good we have it here. Every time I complain about a hotel room or the hassle of moving or how hot it is, Mark says, "We could be like the people in Japan, homeless and sleeping in the cold, worried about everything." It was a good reminder to be grateful and to give back while we shopped. The Red Cross Japan Effort is getting more of my money soon. With our list of items we needed in order to function in our new apartment, we checked out of Don Quijote with a few bags and drove to our apartment in an area outside of Honolulu. We took inventory of what we still needed over lunch at a local cafe. My idea was to hit Bed, Bath and Beyond and Walmart for the rest of our items. Mark decided it was time to buy a new car. Yes, we have a rental car for a week. After that, we are without transportation. There's a bus that goes from our town to Honolulu and if needed, Mark can bus it to work, but we decided we still need a car. Off to Honda Windward it was. Such a great experience. We spent four hours there and felt like we made new friends. Sitting and getting to know people is a big thing here. We "talked story" with the Finance Manager while our car was being readied and the paperwork was being completed. His son had recently moved to San Francisco and needed a good auto mechanic. I gave him the name and number of the best, most honest mechanics in San Francisco - Richardson Automotive (415) 929-1210. I dropped off my new car in one of our two allotted parking spaces at our apartment complex. We then took the rental to Bed, Bath and Beyond at the Pearlridge Mall. Don't follow the directions off iPhone maps. We drove around Aiea and Pearl City trying to find the mall. We turned off the phone and followed our instincts and landed in the parking lot at 6 pm. TWO HOURS and two shopping carts later, we left Bed, Bath and Beyond. Dinner was at Ala Moana Mall Food Court, only because it was quick, there was parking and security to monitor our stuffed car. We stopped at our trusted friend's place to pick up a few remaining items and drove back to our apartment. At 11 pm, we were hot, cranky, tired and just wanted to unload the car and get to sleep. Forgetting about the conditions of the people of Japan, I was focusing on my returning sore throat and feeling run down. Mark drove into the parking garage and up to the top level to find his parking space. The painted numbers for each space had been faded by the sun and we couldn't read any of them. We drove around looking for any number we could read, but the spaces weren't numbered exactly in numerical order. I got out and crouched down to try to read the faded yellow numbers better. Mark and I hardly ever get irritated with each other, but this was pushing us. Finally, I stood in a space and yelled for Mark in the car on the other side of the rooftop. We found it! Tired and cranky, we unloaded what we could and dragged ourselves to our place. We plopped on the bed and turned on the AC unit in the bedroom. It sounded like a sick jet plane ready for takeoff. There was no way to sleep with that on. Begrudgingly, we stripped the bed and brought the sheets and pillows into the guest bedroom. Good thing we got a two bedroom place! The AC unit was quiet and soothing and we were fast asleep in no time. I woke up a solid eight hours later to the sound of tropical birds chirping. Mark made coffee and we sat in our new fold-up chairs watching the morning sun over the green mountains of Oahu. Ah, this is why we moved here. Our thoughts are still with the people of Japan and we hope they recover soon. I am grateful for the new place to live in a beautiful setting with only two beds, fold-up chairs and a small table. I am safe. My loved ones are safe and healthy. All is well. Cynthia, what a wonderful post. Thank you for the nudge: things can always be worse! Hey, so happy to have found your blog! And to get to follow along on your wonderful new adventure. Thanks Sara. It sure is an adventure. Hawaii is just like Vermont, right?